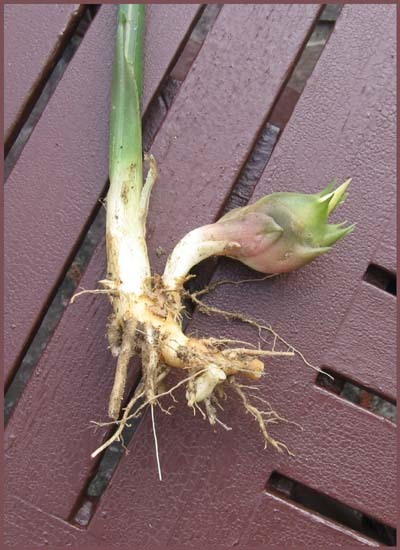 myoogatake (みょうがたけ) 茗荷竹 "myoga bamboo"
It is often grown in houses. They can get about 40 cm long. They are a delicacy to eat fresh or in soup. myooga no ko 茗荷の子 "children of myoga"
the sprouts coming out near the root. In the wild, they come out of the ground like the bamboo sprouts. If they grow, a flower will come out at the end. They grow new ones day after day and look almost like orchids. Shrine Asusuki Jinja is famous for its myoga divination during the Myoga Festival. On the third day of the new year (now on the Setsubun, 3rd day in February) they use myoga to divine the outcome of the rice crop for the year. The myoga is grown in a special field in the shrine compounds (shinden 神田). Kyoto, Kanego-uchi 金河内(かねごうち), Ayabe city. The crest of this shrine is the myooga, see below. 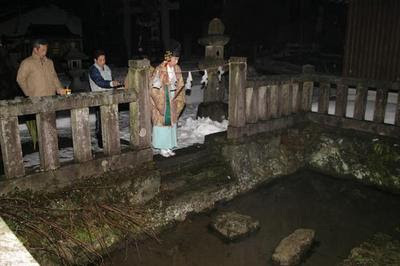 On February 11 the festival is held in honor of a small patch of myoga that can be harvested in winter, it grows on a small island in the pond "Menu no Ike" 女奴池（めぬのいけ) of the shrine. It is bright green in winter in the snow, a very special kind of plant and one of the seven strange things of the Tajima area 但馬七不思議. The festival starts at 6.30 in the morning, when the priest enters the small pond and takes some samples of the sprouts. According to the form of the buds and root and the pinkish shine, it is used to predict the harvest of the coming year. After the festival, special myoga mochi for 100 persons, myoga sushi for 50 persons and some tea of the local black beans is given to the visitors. "May we enjoy a long life! myooga medetaya 命賀めでたや". In olden times, it was forbidden for women to participate. Today, the villagers come together, sometimes only 30 people of the community.
. . . CLICK here for Photos of the festival ! Myoga 茗荷 grows wild in my own garden in Okayama. Its name might go back to a word of the same pronounciation 冥加, the divine protection of Japanese kami gods and Buddhist deities, divine happiness and blessings. Myoga will ward off evil. It is also the symbol of the esoteric deity Madarajin 摩多羅神, see below, and therefore thought to be an auspicious plant and food. Its form is often used for crests of temples and shrines. Sometimes called one of the"wasei haabu", 和製ハーブ　Japanese herbs. It is said to be slightly anaesthetic and ward off a cold in winter. Most myoga is grown in Koochi in houses, in Gunma and Akita in the open, and the myogatake is grown in Miyagi prefecture. One of the disciples of Buddha Shakyamuni, Culapantaka (Cuuda-pantaka) , had a hard time memorizing things and could not remember his own name, and even when Shakyamune places a name plate around his neck, he forgot to look at it and finally died without remembering his name. On his grave a strange plant started to grow. In a play of words it was called: "He did not even remember his name and had a hard time" 彼は自分の名前を荷って苦労してきた, taken the two Chinese characters for 名荷 and placed the plant radical on top of the first character 茗荷. you will loose your memory. So there is a rakugo funny story ”Myoga yadoya　茗荷宿屋” about this, when the owner of a small lodging facility tried to cheat a visitor about money, but ended up not getting his services payed, since his guest forgot to pay when he left and he forgot to remind him of the payment. 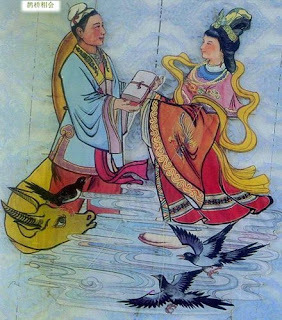 Myoga is also the name of the bird that helps bring the lover stars Altair and Vega together on Tanabata, the night of the Star festival. For the O-Bon festival in Western Japan, people make decorations of a cucumber horse, an eggplant cow and a myooga sticking out with its long white part like this bird. If someone is posessed by a fox spirit キツネッタカリ, you should give him myoga to eat, since foxes do not like this taste. Myoga patterns are often used as family crests. This is one of the 10 most famous family crests in Japan. gyooyoo 杏葉 Gyoyo is very similar. 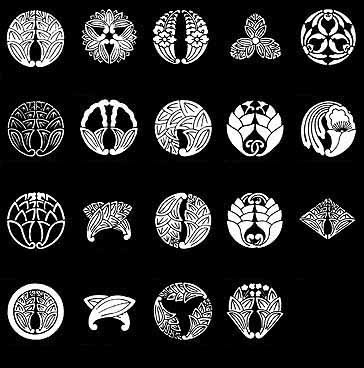 The Gyoyo-mon was used in various ways as a family crest of the Nabeshima family. The exhibition room is filled with splendid lacquerware and gorgeous artifacts of the daimyo. (Zingiber mioga, Zingiberaceae) is an herbaceous, deciduous, perennial native to Japan and other East-Asian countries that is grown for its edible flower buds and flavorful shoots. Flower buds are finely shredded and used in Japanese cuisine as a garnish for miso soup, sunomono and dishes such as roasted eggplant. A traditional crop in Japan, myoga has been introduced to cultivation in Australia and New Zealand for export to the Japanese market. As a woodland plant myoga has specific shade requirements for its growth. It is frost-tolerant to 0F, -18C possibly colder. While some constituents of myoga are cytotoxic, others have shown promise for potentially anti-carcinogenic properties. Myoga is one of the TSUMA additions for a good sushi. Myoga as an addition to sashimi, tsuma, like a good wife, should bring the taste of the original out and therefore the sprout has to be cut into very fine slices. fudemyooga 筆茗荷 ふでみょうが "like a brush"
It is white at the bottom and has a pinkish shine. This is best eaten in spring. but now only two place names remind us of the vast fields that used to be in this area (and an old lady growing this kind in her back yard).
. . . CLICK here for Myogazaka Photos !
. . . CLICK here for Myogadani Photos ! At the Myoga Valley, there used to be a stone statue of a small Jizo Bosatsu. When villagers went get a doctor for a very ill person, they came past this statue. If it was there as usual, the ill person would be all right, but if the stone statue faced the other sice, the doctor could not help any more. This is a Buddist festival for the Deity Matarajin. The God appears riding on the black cow. It is held in Kyoto on the 12th of October at the temple Kooryuu-Ji (Koryuji　広隆寺). Even today, there is a famous statue of a "string-bound" Jizo Bosatsu statue at Myogazaka in Tokyo. 文京区 Bunkyo ward, 小日向1丁目と3丁目、4丁目, Kohinata first, third and fourth sub-district.